Tap Shoes and Birthday Parties! I don't know where to start! We've been home since the 20th of February and have been so busy that I've neglected my dear diary of retirement! 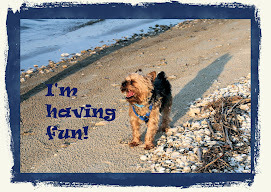 My most fun things are too numerous to mention, but you know me! I'll try to recapture them for you. I am getting a pool, which you saw previously so we've spent hours working in the yard destroying my beautiful rose garden...hopefully it will arise a bit further back in the yard behind the pool! Then...tahdah! I had three birthday parties! and I got presents!! and you know how I love parties and presents!!! My first party was with a huge (try full sheet!) cake decorated in Notre Dame colors and presented to me at McDonalds by my favorite husband. The fire marshall wouldn't let them put 60 candles...yes, I'm 60...so they had to use the little 6 and 0 candles...thank goodness or I would have singed my hair trying to blow out 60 candles. We fed everyone, including the wonderful staff at Mickey D's who take care of us so well every morning! My loving daughter came for lunch and brought me Thin Mint Girl Scout cookies!! A personal favorite. She does know her mommy. My next party was at Long Hollow Jamboree. Hence the tap shoes from my dear friends Bill and Jane. 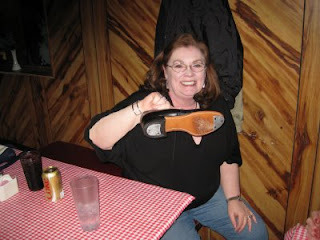 You must have tap shoes...you even see taps on cowboy boots!! We've started going to the Jamboree every Friday night to have dinner and dance..or try to dance. The cheeseburgers are devine and Woody loves the always gourmet "half pound of ground round"...he feels so cosmopolitan! Shades of Clinton in the 50's! Ask him about that! We've learned the two step and watch the cowboy cha cha but we're not quite ready to tackle that yet! 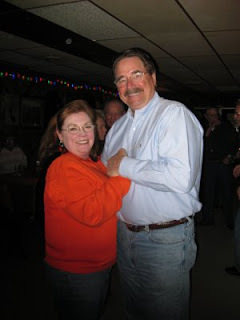 I do the electric slide with Jane, which for those of you who don't know...it's an old line dance from the disco era countrified. My third birthday party was with my cohorts in crime..our dinner club...three of the girls are turning 60 this year! Cindy in April, Donna in July and Holly in about 12 or 15 or 18 years! She lies about her age so we really don't know when she'll get around to 60...we do know she's much younger so we keep her around to bring us chocolate when we hit the nursing home! She's promised to visit. We had a wonderful dinner at Macaroni Grill, and then back to Donna and Mike's for cake and ice cream. We had a bonfire in the fire pit and watched Roy play with psycho cat! Psycho cat used to be really sweet until Emily left it too often with Mike! I think he did something to the cat! I got flamingo beach towels for the pool, a wonderful book and chocolates and great accessories for my guest bath! The only problem...I gave up chocolate candy for Lent so it's sitting and waiting for me to open on Easter. The older I get the more compliant with Lent I think I need to be...so I'll just wait on the candy! Hugs to all of you! I'll try to do better with keeping you updated on the exciting life of Woody and Pat at home...rare though it is!